MONTVILLE _ Sammie Booth and her father, Steve, have spent countless hours in the car together traveling to softball tournaments and clinics. Some of the trips were long, taking the duo to Penn State or Maryland, but they never turned the radio on as a means of avoiding conversation. Sammie, unlike many teenagers, didn't put on headphones or become absorbed in any type of electronic device, either. "We just talk the whole time about everything," said Sammie, a standout softball player and recent graduate of Montville High School, where she had the distinction of establishing the record for career hits. "It doesn't matter how long we are driving." The bond between Sammie, who will continue her academics and athletics at Drew University, and her dad is strong. Sammie doesn't want to miss a word from Steve, who has been a paraplegic since 1984 when he was was a passenger in a car that was involved in an accident in Panama City, Fla. It was through Steve, a football and baseball player during his days at Parsippany Hills High School, that Sammie, versatile as an infielder and pitcher, became such an exceptional hitter. Her outlook on life in general, too, stems from her close relationship with her father. "No matter what's going on with him, he does his best to put on a happy face," she said. "There are days when he's not feeling that great but he has such a great outlook on life. My dad is always inspirational to me. I admire him. He doesn't mope or complain. "He has so much grace and class. No matter how bad things get, I've realized someone's always got it worse than you do." 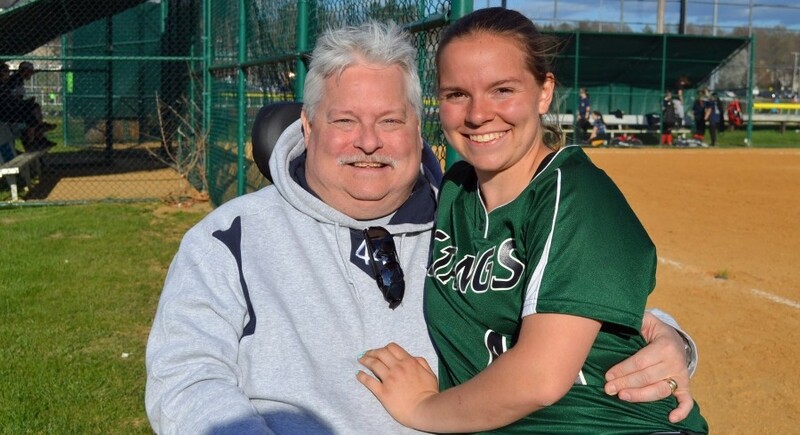 Being in a wheelchair did not stop Steve from teaching Sammie, a four-year starter for the Mustangs, the elements of softball. The duo have been working on fundamentals since T-Ball. They'd play catch, do soft toss and use a tee. While playing catch, the ball sometimes bounced off of Steve's legs, bruising them. Sammie had to chase the ball if she didn't make an on-target throw. "Sammie always has been self-motivated," Steve said. "She'd ask me to help her with hitting. She's more motivated than anyone I ever knew or played with. Sammie's competitive at everything, even checkers." To this day, Sammie, whose twin brother, Dylan, will attend RIT, does not have a paid hitting coach. Steve watches her take her cuts at the plate or in practice and tweaks her swing. The 148 hits she amassed at Montville are as much his as they are hers. He believes a person has to do something 500 times to make it a habit. Sammie, despite the repetition, was gleeful about learning. However, Steve is modest about the impact he has had on Sammie. He says he is simply conveying some of what he learned from Jack Mott, his high school baseball coach and former manager of the Budweiser Belles, a women's major fast-pitch softball team. "Jack would be proud of the way Sammie plays the game," Steve said. "She plays 110 percent and is a great leader with a good temperament. Sammie never folds under pressure." Those are the same attributes her father had during his years spent on the diamond as a second baseman, the gridiron as a running back and safety and ski slopes as a racing instructor. "Steve was extremely competitive but not in a mean-spirited way," said Jason Perlett, one of the elder Booth's high school teammates. "He wanted to beat you - badly - but he did it with a kind of a sly smile on his face." Perlett noted that Steve is "an excellent dancer" with "an innate sense of rhythm, hugely important in sports where timing and coordination merge to make a tackle or field a ball in the hole." In addition, Perlett recalled Steve's determination, spirit and inner strength - traits, no doubt, inherited by his daughter. His approach to hitting was basic yet effective. "As a hitter, Steve was successful because he took everything up the middle," Perlett said. "He felt there was more room there and, of course, he was right. He hit the ball where it was pitched, never trying to force anything. He was aggressive but didn't expand the strike zone too much. He would much rather earn his way on base with a hit than a walk." The two worked on the mental aspect of sports as well. Eighteen-year-old Sammie, a co-captain of the softball team her senior year, had a certain demeanor. "I was taught to play the game right," said Sammie, who ran her own program, Booth Camp, this summer. "In high school, you're a role model and people watch you play. The younger girls want to be like you. That's why I never get frustrated and throw equipment. I'm stoic. At home, I can feel any way I want. You can't let other teams see weakness or know that something bothers you." Steve suggested she "play the game like Derek Jeter," remembering to be humble and not get upset. The accident, of course, in which the driver of the car was intoxicated and going 110 mph, altered Steve's life forever. The vehicle he was in rolled over three and a half times. Steve was thrown from it on the second revolution. He broke his back in three places, sustained a collapsed right lung and lacerated liver and had to spend eight months at Kessler Institute. When Sammie was a junior, Steve was unable to drive for awhile. He hired a car service to take him to games, including one at High Point. He and his wife, Lorraine, have been fixtures at her games since she started and will be watching her at Drew. "There's a really special bond between them," Montville softball coach John Immediato said. "Sammie's dad is her No. 1 fan and biggest supporter. Sammie is one of the most coachable kids I've had. She puts the team before herself. Steve must have instilled that in her at a very early age."